Your feedback is one of the most important things we consider when planning updates and improvements to Google Custom Search. In addition to reviewing the feedback and suggestions that you make in our user group, we're opening up a Product Ideas page for you to share your opinions about Custom Search. Just like other Product Ideas series, you'll be able to submit your own idea and vote for ideas from other users. If you've got ideas or suggestions for Custom Search - features you want, things we can do better - tell us! We want to hear from you. We've created a set of categories, so please try to find the most appropriate category for your suggestion or idea. Product Ideas for Custom Search will remain open for you for the next month. If you have questions, visit the Product Ideas FAQ - but if you want to get started right away, go for it! 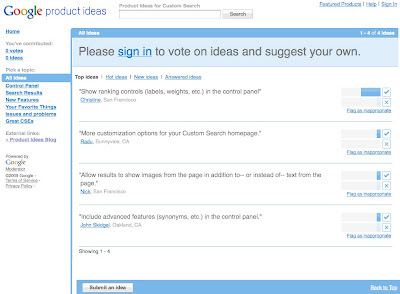 Vote for a suggestion, or enter your own idea on the Custom Search Product Ideas page.